There is a lot of concern with keeping budgets tight and one place many feel is necessary to cut back is with meetings. The meetings and travel industry has had to prove its value in these tough times. In a recent article in Meetings Magazine, this was tackled head on. Meetings can energize people and build team spirit. The importance of building relationships in a face to face manner have great value. Sheila Smith Le Corre is the Director of Business Development at Martin Bastian and she said that, “People have a basic need to interact. For companies this means bringing people together to hear about plans, measure progress, network with colleagues or customers, share best practices and recognize superior achievements.” She also explained that these interactions cannot be replaced by a conference call or vitual meeting. It is good for the company and the customers to have an inspired workforce and a meeting can motivate staff and help accomplish this. I look forward to helping to build your team with my inspirational keynote presentation. Check it at InspireBiz.com. One benefit that comes from this downturn in the economy is that consumers can get some great deals and meeting planners can get some very attractive packages for their events. In January I had the opportunity to speak for a group at the Magic Castle Hotel in Hollywood. One morning I strolled down a few blocks beyond Hollywood Boulevard with a few of friends and we ended up at the front door of Jim Henson’s Studios. 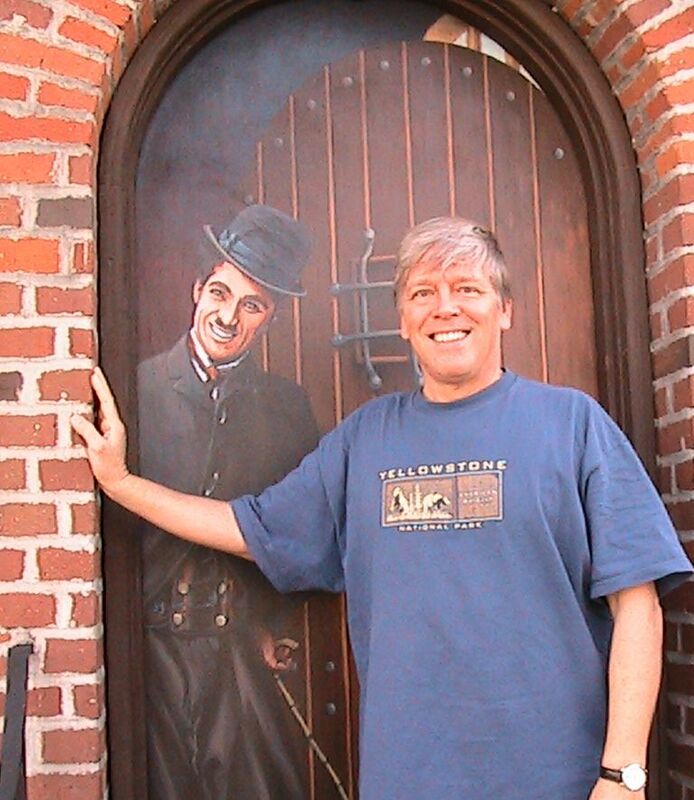 At the front door of the old Charlie Chaplin Studio in Hollywood old studios ran by Charlie Chaplin. The complex is currently owned by the Jim Henson Studios. They work on several TV programs here. They still shoot several Muppet programs there but these are mainly guest appearances and promotional shorts as the Muppet TV show is no longer in production. On the front door of the studio is a simple and loving tribute to Charlie Chaplin. It is a life size painting of him on the door. Below in the still sturdy concrete are the imprints of the footsteps of Charlie and his autograph signed into the top step. Chaplin has had a big impact on my life. I enjoyed studying his hilarious comic style and his incredible gift of storytelling. For many years Chaplin was the toast of Hollywood and he was loved across the world for his little tramp character. The Chaplin character, on screen, faced many challenges and yet he stayed optimistic through the struggles. He inspired a nation and world that was faced with poverty and depression. Perhaps people who watched his movies found a spark of hope for a better life as they watched his feisty spirit race across the screen. His ingenious comic solutions to problems and adversity can motivate and inspire us too. What can those who run a business learn from this legend of Hollywood? 1) Perseverance. Chaplin on the screen never gave up. In a film about the 1849 Rush to Alaska titled, The Gold Rush, Little Charlie fought some big Goliaths, including a band of villains, a fierce bear, and a huge and very hungry man who at one point wanted to eat Charlie! This is the funny movie where Charlie suggests that they eat their shoes, rather than each other, and the hilarious moment as the two are seen munching, like spaghetti, on shoelaces and attempt to chew a shoe sole that is as tougher than a $5.00 steak. In other films he would inspire us as he helped a street orphan or rescue a distressed maiden. He even saved a country in his film about WWII entitled, The Great Dictator. In the end somehow Charlie persevered, found solutions and saved the day. That is inspirational. Off screen Charlie Chaplin struggled with giants such as studio heads and others who would attempt to stifle his creativity. After many disputes about creative outcomes of his films pressured by the studio heads on Chaplin’s artistic ability he finally created his own independent film company. He was instrumental in getting his friends Douglas Fairbanks and Mary Pickford to join him in the creation of a new kind of film company – United Artists. Its purpose was to put the artists and creators first in the creative business of film making. 2) Vision. Chaplin was true to himself and his vision. He had a clear vision for what he wanted to achieve and he did not vary from his mission. If a film succeeded or failed artistically, he was where the buck stopped. He took the responsibility and along with that came great rewards. In business we need to have a clear vision and take reasonable risks to achieve the goal. The outcome can result in the rewards that come with success. 3) Optimism. Charlie Chaplin projected optimism in his films and this was encouraging to his audiences. Audiences were encouraged by this optimistic attitude. Everyone likes to be around those who are optimistic. This attitude in us and our business will make us more appealing to our coworkers and customers. 4) Excellence. Chaplin’s excellence in film making came from years of experience doing the sometimes difficult work of comedy in the comedy clubs of his day, the music halls. These variety shows were in theaters in the rough and tumble small and mid-sized villages as well as inner city factory areas across England. This school of hard knocks taught him the skills needed to make an audience laugh. He instinctively knew what was funny. Excellence comes from striving to do our best at all times. We also need to continue to train and study to improve ourselves and our businesses. I suggest that you might want to go and rent or purchase a Chaplin movie, laugh, and lift your spirits. You may also consider ways to implement these ideas into your work. You can bring humor to the workplace with my motivational keynote program. Discover more at InspireBiz.com. In today’s competitive economy some times the only difference between products is the customer service. Two stores may sell the exact same thing, but the customer’s perceptiopn of how they were treated will make a huge difference in their loyalty to that store. In other services, from lawyers and real estate, to auto repair or tire sales the products or services may be similar or seem similar to the customer so there needs to be that extra thing that makes you stand out. Excellence in service can be the thing that brings the customer into your business again and again. Car shops can encourage their staff to give a friendly smile or even take some extra time to explain the problem with the vehicle. Here is a short Customer Service Checklist. Answer the Phone. It is surprising how many people deliberately do not pick up the phone at their business and let it roll over to a taped message and then use that message to screen the caller for some general purpose. Return calls in a timely manner. This is a powerful way to demonstrate your efficiency and the concern you have for the customer. If you take too long to get back it reflects on your desire to serve and help a customer. Smile – This is a simple but very effective customer service tool. It is also just a way to extent kindness and friendship. Explain things patiently and kindly. Make things clear. Whether you are explaining benefits or features of your product, it is easy to sometimes slip into jargon or temenology that is not clear to others. Avoid this and ask questions to make sure it is clear to the client. Don’t sell – help them to buy. Be a consultant in your selling approach. We want out customers to become raving fans who will tell others aobut the great service and quality of our product or service. How do we benefit from customers who are raving fans. Word of mouth is a very powerful way to generate more business. Positive word of mouth is a hard thing to generate, but it begins by exceeding the customer’s expectations and showering them with excellent service. Encourage and motivate your staff to go for the gold with the motivational speech on Service and Teamwork. Salute the excellent service your staff gives with the motivational presentation at InspireBiz.com -or Inspire.Aces-Show.biz. You and your business may be considering a display at a Trade Show. This information is geared to help you have success at this special event. A trade show is a wonderful place of opportunity for you. From the moment the doors open, opportunity is knocking for your business. The guests are there to get ideas and learn about new products or services. Most people who come to a trade show are in need of a service like yours, they just might not know it yet. This is the best place to meet new and motivated customers. This is your opportunity to share how your product or service can best help them. This face to face meeting can have better results than web or print advertisement because they get to know you and get a real feel for what doing business with you would be like. The following are a few keys that will help make your product or service shine. These keys can lead to great results for you and your business. Key #1: Make a great first impression. It is said that you never get a second chance to make a first impression. A positive first impression should be your initial goal. From the way you design your booth to the friendly courteous attitude of your staff. The magic of quality and service should shimmer from you and your team. You should be seen as friendly, supportive, a good listener and one who strives for excellence. This is as important as your skill and product knowledge. Key #2 Give them your Undivided Attention. You only have a few moments to convey that you and your business would be advantageous to the client. This can be demonstrated in the way you greet and talk with the potential client. The trade show environment is one of excitement, noise and distractions. When you give full and direct attention to each individual who comes into your area, you can help keep them from being distracted. You also demonstrate how important they are to you and show the way you give good customer service. In this way you can show how you are interested in their needs and wants. They can tell that you have an active interest in helping them solve heir problems or satisfy their needs. A trade show will open many doors to new opportunities to meet and impress new customers. You will also meet businesses in which you can make alliances and partner with. Even a friendly connection with a competitor can result in opportunity. This business may have a over booking and have to send some work to your business or have a very huge client that will need you both to team up and help. Make many connections and keep in touch with them. More tips to follow in this column. You are currently browsing the Inspire Biz News blog archives for February, 2010.